A quick post before we get ready for a family celebration on the other side of the GTA. These are a few of my favorite work and home things that I am grateful for, today. With much elbow grease and time, I used linen warp yarn to sew velcro strips across the top of my Christmas gift kilim. Such a warm addition to the studio! It’s just behind my Mighty Wolf loom. Tomorrow, I have my 4th weaving class in the fall term. A new commission has jumped off the wheel (Watson, Martha) and onto my needles. It’s for someone special, and is making me ridiculously happy. Clearing a bunch of singles. Each was once a sample that came from a fibre event or with a spindle. As a bonus, I got to practice the Andean plying trick while reliving good times. Mahatma Gandhi was absolutely correct. You do want to spin cotton each day. I feel that the spinning wheel has all the virtues needed to make one’s life truthful, pure and peaceful and fill it with the spirit of service. I, therefore, beg of you all to give half an hour’s labour daily in the form of spinning. This is my start of the 4th round of singles for my CVM wool project. I use the Louet flick card for each lock before charging the Schacht cotton hand cards. The waste for 5 rolags is in the container on the left. 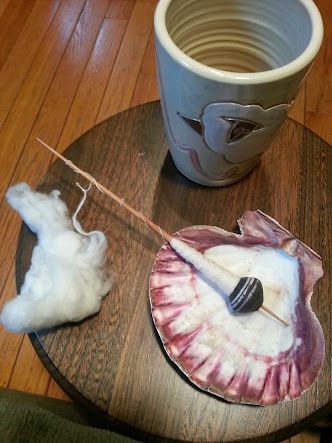 In this round, I am retiring the Tabachek top whorl spindles, and have introduced my now cleared Andina low whorls. My hope is that using 4 low whorl spindles will even out the spinning phase. I am blessed to be able to make visits to stores like WEBS, and to know that a Moosie and her tulipwood shaft are making their way to our home as we speak. This article bounced out of my Twitter feed, today. Reading reminds me again that each of these unwaged activities has as much value as my previous waged work. As boneheaded as this lifestyle strikes many in my sphere of reference, I have tremendous support from my family unit. Categories: Holidays Happen, Spinning | Tags: cotton yarn, CVM wool, handspun yarn, LYS, Materials, Spinning | Permalink. It’s been such a long, long time! There’s a lot I could do in the way of explaining but suffice it to say that yielding 4 entire days (and then some) to income earning has been a major shift. Returning to this place where I can’t just dig off & do my own thing has been rough, I’m not gonna lie. Basically, it has taken me this long to make peace with change and get a grip on having life’s work go into a hobby zone. The start-to-finish time-line on projects is achingly slow but on the bright side, I can self-support this burgeoning fibre habit of mine! One of the wondrous breaks over this Woe Is Me period was our trip to Philosopher’s Wool in Inverhuron, Ontario on Labor Day weekend. It was an all-out blustery day but even so the 4-hour drive was spectacular. Working farm after working farm nearing harvest. Some had For Sale signs. Others had Puppies for Sale signs. DH was very good about entertaining my glee while not stopping. The small sign to the bottom right reads the Philosopher’s Stone. DH, not given to what he terms “aimless wandering,” insisted on calling from the car. Directions were to turn around and walk in (groan)… Two seconds later we arrive, and Ann Bourgeois greeted us like old friends. She was tickled pink that someone had actually called from her parking lot… almost everyone gets it wrong but this calling in was a first! She just thought DH & his initiative were the best. He responded well to this treatment. Now, I was pumped from the get-go. Earlier this year, my knitting friend, Fen, gave me her copy of Ann & Eugene’s book, Fair Isle Sweaters Simplified. Fen knew I that would love the story of how they built their farm, and wool yarn business from scratch right here in Ontario. With Dorset sheep, no less. In his Introduction, Eugene explains that selling his wool into the co-op system yielded $0.32 per lb. In 1984 they sent the raw fleece to a mill for processing & sold the yarn for $2.35 per lb. They became the co-op alternative for farmers, and eked out a niche in the yarn market by self-marketing & Ann’s fair isle sweater kits. As you can guess, the postcard is of Ann & Eugene a few years aback. He fled into the barn on my approach. I swear DH loved the chickens! Aside from hearing about the business we also talked with them about what it’s like having Bruce Power as a neighbour – very interesting stuff! By the time we were done touring, talking and buying, I was ready to resign on Tuesday and follow Eugene’s lead into this farming life. They were so warm, engaging and generous. I agreed with Ann about not wanting to be that close to her neighbours! There was a fair amount of people swimming in the lake. Windy, cold & choppy… mystified us! Categories: Holidays Happen, Stash in; Stash out | Tags: Farm, LYS, Materials, socializing | Permalink. With my friend’s baby shower looming, I’ve had to tear myself away from the Wee Peggy wheel, and back into knitting mode. It was a wrench. Only accomplished by shunting the wheel & all of her paraphernalia into another room. Still hush-hush on this gift but I can let the working title slip, right? Blankie Love. I wet blocked the last piece of the body – 3 0f 3 – last night, and have a morning to post to my heart’s content. Then there will be seaming, a lot of stitches to pick up, and a border to be made. By Saturday… it’s tight but doable. This is my friend’s first pregnancy after a long period of trying. I wanted this blanket to just be a real celebration. It’s my idea of how a baby should be welcomed into the world. There are notes, and charts that I’ll be writing into a pattern. This is the now-refreshed Wee Peggy. Polished, oiled, and scotch tensioned. She may not look terribly different but trust me, she sure feels different. From clunking along to purring different. The Coopworth turned out to be great for getting the hang of this wheel. Having ½ pound to play with has been fun! Believe it or not, I am on my 3rd bobbin of singles! Do you see the size of that ball? It’s just an outer-feed ball of 2 singles. DH is in awe at this output – he just sat there, staring at me spin! The spindle is my Grafton tulipwood Mala. Please forgive the heavy shadow in this pic – we are having a gloriously sunny March morning over here! What’s up next in knitting? I want to use my handspun, of course! Categories: Getting the knack, In the Pipeline, Spinning, Stash in; Stash out, What I'm up to | Tags: Baby gift, BFL wool, Coopworth wool, drop spindle, Equipment, LYS, Ravelry, Spinning | Permalink. This blogger might just be the world’s first yardie yarnie. Just to be clear – I do not want this getting back to my Mother, Father or in-laws. In this regard, TKK is counting on her dear brother to remember who kept all his tattoo news to herself. The price was right. $25 for this much wool – hello?! Sirdar’s 100% undyed virgin Eco Wool dk yarn sells for $6.99 around here. That’s $6.99 for 1¾ oz. How much does ½ a ram yield you ask? This one is 7 lbs for $25. I am not skipping the part where I’ll have to wash, dry, and then comb the locks into the actual raw wool. Then turn my hand at spinning. I know. I know. But still. Listen, if someone else does the dirty work the roving from Romney fleece starts at $25 per lb. My seller says she paid double for the raw fleece. Even my clueless yardie self knew that Romney wool is, to quote Martha, a good thing. It has an even crimp & is relatively low on the lanolin. That was my intuition. Boy was it a relief to then look it up & see many a yarnie recommend Romney as the starter wool for spinning! I liked the fact that it is natural grey wool. For all of this madness, I draw the line at spinning. Dyeing isn’t pulling at me. Yonder farm is inside of 100 miles by half. I am meeting my seller in the next town over. Drop spindles captivate me. In the same way knitting used to before I got the knack. Felting projects have been occurring to me over-night. Baby Sierra’s room might do well with a grey felted bunny, and so on. DH okayed the madness. He was shocked at the offer price – he’s caught on to what a sweater’s-worth of yarn costs. He wanted to trade permissions – I get this wool & he gets his coveted video card. Well that effort flopped – the video card is 10xs that wool! All of which is very true. However, this might be a tad more bitten off than is chewable. Where/ how shall I store this baby? Can you hide 7 lbs of wool from a visiting in-law? FIL arrives in a week! Back in the now… My Hottie Hottie tank top hit an equipment roadblock. My longer 4.0mm circular needle went missing. For all the searching, it was well & truly lost. One thing led to another, and now I have an Addi Turbo 4.0mm circ. Talk about getting the knit knack! Light, bright & beautiful. Addi Turbos give you wings! Of course, I found the old aluminum needle the very next day… outside, chilling on the patio. How rude! While I was in the LYS why not stash for my MK Carroll Tillie Cloche Hat? Just as a parting pic – this here is a backyard butternut! Categories: In the Pipeline, Stash in; Stash out | Tags: Baby gift, Equipment, Flora, Hat, LYS, Materials, Romney wool, tank top | Permalink. Last I wrote there was to be furious fingerless glove knitting this week. For my cousin’s (long over-due) birthday gift. One, “Are you nuts?” glance from DH put paid to the idea. Him noticing an unspoken vibe between women? Woke up. Smelled the coffee. Yes, it is true that she is decidedly underwhelmed by the knitting thing. So, I did the right thing & pulled the plug on that project. Away to the mass market I go. Chuh! Bumped up the knit queue is a cotton tank top. So, yet again, I am carrying a non-descript circle of yarn to Pub Night 🙂 This time it’s red. Raided odds & bobs of jewelry for the stitch markers. No questions! It will be a cotton tank top à la Kristen TenDyke’s Provence Broken Rib Tank. A free pattern here. It has rave reviews on Ravelry & looks like a winner. Her model looks demure as demure can be. I, on the other hand, am going in another direction. Working title? Hottie Hottie Toppie! My little bougainvillea has smiled upon me. Paradise in a pot, people! Not as homesick with this baby to look at! Frankie Flowers of CityTv wasn’t kidding when he said August is a good time to fertilize. What will I do when the growing season is over? The next project in queue is there to stay. It’s the Sushi Moss baby gift! We now have a gender & a name. As we hoped, it’s a girl! To be named Sierra. Although my cunning plan is underway, I can’t say too much… Her Momma stops in here for a read every so often. Must be a surprise! So far, I have pattern ideas & the yarn is on order. Back story on the yarn order. So, I was all excited to drive the 20 mins to this LYS. They have an annual summer sale & I have ideas. First I went when it was closed. Yes, I have a history of doing that. My bad. I go back the next day (scenic 20 min. drive) only to be sorely disappointed. Where are the mark-downs? Live & learn my friends. Apart from this small order, I left empty-handed. Onwards to their competitors’ sales. Categories: In the Pipeline, What I'm up to | Tags: Baby gift, Flora, LYS, Ravelry, tank top | Permalink.